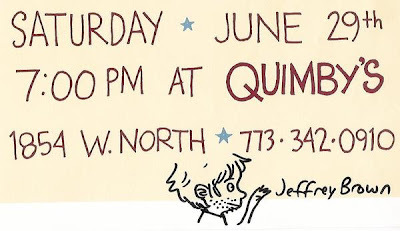 A self-portrait sketch by Jeffrey Brown from the bottom of a reading/event featuring him and Paul Hornschemeier at Quimby's in Chicago. A teeny sketch, to be sure, but still the entire poster as a whole is pretty cool, was acquired cheaply (though not in person... got this at a show), and looks like a rock band gig poster. More comics-related things oughtta have all that going for them.